A tender folk song of long ago went thus: Uccherrey burj Lahore dey, heth vagey dariya ve mahiya. (The towers of Lahore are imposingly tall, and oh my love, the river flows majestically below). But the Lahore of 2011 is vastly different; the Ravi has shifted its course and has dwindled into a pathetic stream, and the lovely havelis of the old walled city are a travesty of their former romantic elegance. The qabza group, the construction mafia, have their beady eyes fixed on a number of old city residences, upon which they wish to erect ugly commercial plazas. Some of these havelis were originally the dwelling places of princes of the Mughal court, and are said to have tunnels connecting them to the nearby Lahore Fort, which are now blocked up. Travel writers like Salman Rashid say nay to such tunnels, but I have seen a TV programme on Lahore’s city gates where a resident of a haveli took the camera right up to the entrance to a tunnel in his courtyard, which was blocked. There is a blog writer whose great grandfather delved into a tunnel underneath the Fort just before World War I and walked along it and got lost, and was finally rescued after half a day’s wandering. He said that up to six horse riders could pass along it. Somehow my love of exciting mysteries tells me that these tunnels simply have to exist. The enthralling walled city, the very heart of old Lahore, contains mosques, the grand Fort, 13 gateways, residential buildings and palaces, tombs, alleyways and open squares. It has been described as "anarchic, boisterous, crammed, decrepit, exuberant and aromatic." Over a period of time much of the city’s walls have crumbled, along with some of its gates, which were constructed during the time of Akbar. In Maharaja Ranjit Singh’s rule the fast falling walls were rebuilt in 1812. During the British era, the height of the walls was reduced from 20 to 15 feet, and eventually they vanished. The gates were the only signs left of the past glory of the walled city. The Lohari or Lahori Gate and the bazaar behind it was the oldest arterial route into the city, and travellers coming from Multan used to enter from here. It might have derived its name from the lohars or blacksmiths who had set up their businesses in that area. It is Bhati Gate which is the most splendid, however, situated at the western entrance to the walled city, and occupying a vast area of land. Within it is situated Bazaar Hakiman, home to innumerable legendary figures from the world of literature, art, drama and music of the 19th and early 20th century, including Allama Iqbal and Agha Hashr Kashmiri. 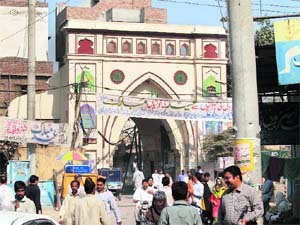 It is said to have been called Bhati Gate because it opens in the direction of Saandal Bar, named after Rai Saandal Bhatti, grandfather of the renowned Punjabi hero Dulla Bhatti. 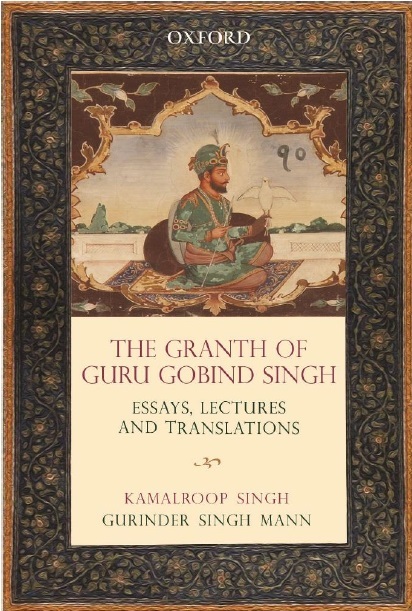 Just outside Bhati Gate stands the mausoleum of Data Ganj Buksh, one of the greatest Sufis of the subcontinent, and it is nearby in his Lal Kothi that the noted contractor Rai Bahadur Mela Ram resided, who laid the Lahore-Amritsar railroad in 1880. He was a devotee of Data Gunj Buksh, and his son Rai Bahadur Ram Sarandas held musical concerts every Sunday at their haveli to which connoisseurs of all creeds were invited. It is heartening to learn that Kashmiri Gate and Sheranwala Gate, which had two live lions in a cage placed at its entrance by Maharaja Ranjit Singh, are going to be restored by the Punjab government in the near future along with Lohari and Bhati gates. For all those who loved and remember the Lahore that was, this is a welcome step towards bringing a unique city complex into some sort of acceptable shape. Delhi Gate was a vital entry and exit point for the city and gave the first glimpses of Lahore to an arriving king and his entourage, and hence was a gate of extreme prestige. A large number of encroachments will have to be remioved and open sewers that are situated as close as ten feet away from the gates dealt with. Butchers, grocers and locksmiths have set up illegal shops close to the historic structures. The sewers will have to be lined with cement to prevent seepage. Plaster made from the same material as that employed in the original structures would be used, and the mortar between their red stone bricks and fading frescoes would be restored. The total cost of restoration will be about Rs 8.3 million, which is a small price to pay if by doing so, a part of the wonders of old Lahore can live once more. Furthermore, plans are afoot to reactivate the Shahi Guzargah, the Royal Route, from Delhi Gate to the Fort, under the aegis of the Aga Khan Trust for Culture, at a cost of `A3 7 million, which will partially restore a tiny portion of a once-grand metropolis and seat of power. 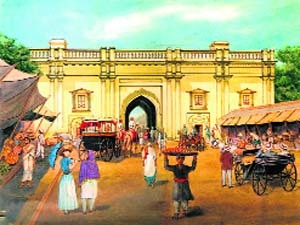 Delhi Gate, a vital entry and exit point for the city, gave the first glimpses of Lahore to an arriving king and his entourage, and hence was a gate of extreme prestige. Its return to its former beauty will be welcomed by all. Tribune India, Sunday, January 8, 2012.